Since I have finished the dutch tool chest last week, I’ve been thinking about the next project that I would like to make. Give a home to some rescued items. 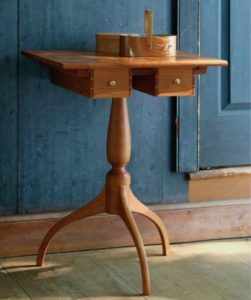 I’ve been spending time looking at a number of traditional furniture styles with an eye toward the Shakers. In particular, I think that I’d like to make something along the lines of a traditional candle stand. However, I think I would like to add some inlay to this table. I have a set of chess pieces that were rescued from a basement. They are currently sitting wrapped in old newspaper and need a more permanent and appropriate home. I’d like to base this on the table made by Christian Becksvoort in the May/June 2017 issue of Fine Woodworking. However, I will be adding an inlayed/veneered chess board to the top of the table. The drawers will act as storage for the chess pieces.